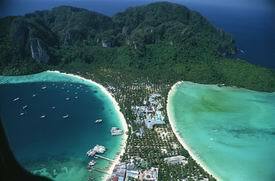 Phi Phi Island + Khai Island 1 day tour by Speedboat. Words can’t really describe how beautiful the Phi Phi Islands are. I have tried to help you with the photos and information on this website, but you just have to see for yourself to fully appreciate them. 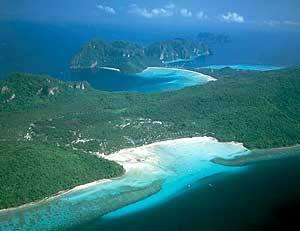 The Phi Phi Islands are among the most beautiful tropical islands in the world. And as such are amongst Thailand’s most popular holiday destinations. The famous movie “The Beach” starring Leonardo DiCaprio was shot here. The islands, together with Noppharat Thara Beach located close by, were recently established as a national park with a total area of around 390 sq.km. 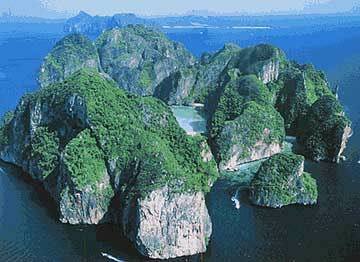 Many of the visitors who come to Phi Phi travel from Phuket just 40 km. away. It is not suprising that many of them think that Phi Phi is part of Phuket, when in fact, both Noppharat Thara Beach and Phi Phi belong to Krabi province. Tourists the world over generally think that the island group of Phi Phi Islands is composed of only 2 isles, Phi Phi Don and Phi Phi Le. But actually, the area of Phi Phi has six isles altogether, these are Phi Phi Don, Phi Phi Le, Mai Phai (Bamboo), Yung, Bida Nok and Bida Nai. The islands and the coastal hills are mostly composed of limestone and are an extension of the limestone mountain range of Phang-nga province. Some common features ande characteristics of the mountains and islands are their steep cliffs, large caves and miniture trees growing out of many of the crevices in the rocks, similar to those in Phang-nga Bay. Among the isles of Phi Phi Islands, Phi Phi Don, the largest of the two which lies in the north, is well known for its fine beaches and the wonderful coral formations located around it. There is a resonable assortment of accommodation (not over developed) which keeps it nice and many tourists return year after year. The main curved bays of Ton Sai Bay and Lo dalam Bay are in the south and are really spectacular offering good facilities.The other beaches are located at the northern end of the island. Several shops on Ton Sai can arrange diving and snorkelling trips around the island or the nearby islands — Phi Phi Le Island, Yung Island and Mai Phai (Bamboo) Island. Phi Phi Le/Ley/Leh Lying almost 2 km. to the south is Phi Phi Le Island. In contrast to Phi Phi Don, this isle is uninhabited, not only because this is banned, but also because there are few beaches able to support hotels. The island’s cliffs descend almost vertically into the sea on all sides. There are a ouple of really fantastic coves Au Maya and Au Lo Sama are the most scenic coves on the island offering a great place to go snorkelling. The sea around Phi Phi Le island is deep, especially the southern part, where it can be over 30 metres making it a popular diving spot to se the beautiful corals. 07.30 – 08.15 : Pick up from your Hotel and transfer to the pier. Coffee or Tea to service you before boarding. 09.00 : Departure from the pier to “Phi Phi Island”. 9:45-11:45 : Arrive at “Phi Phi Lay” explore the fantastic landscape of (Maya Bay Where the movie “The Beahc” was partially filmed) swimming or snorkeling with colorful fishes. Discover “Loh Samah Bay” and “Pileh Cove” and sightseeing at “Viking Cave”. 12.00-13:30 : Enjoy a great lunch at a beachside restaurant of Phi Phi Don. 14:00 : Arrive at “Khai Nok Island” free time on the beach enjoy your time for feeding fishes wimming, snorkeling or relaxing. 15:30 : Departure from Khai Nok Island back to the pier. 16:15 : Arrive at Chalong pier and transfer to your hotel. Snorkeling area, lunch place and program may be subject to change depending on sea & weather condition. Book now all payment after service.